*I am able to thatch with all accepted materials. Usually Water reed – Combed wheat reed – Long straw – heather – African veldt grass. *The materials I use are all organic and eco-friendly. *The methods are often historicaly proven – aesthetically pleasing – and are a practical form of roofing that has natural insulation properties. *I have up to the minute knowledge on fire protection with thatch. *I can liase with builders, surveyors , architects , and/or clients direct. *I have and will travel anywhere to carry out the wonderful craft of thatching . * For larger projects I am able to call on thatchers from England , Poland and The Ukraine. When I was a child my grandmother lived next door to a thatched house in the Ukraine . I used to wonder in amazement at this unusual roofing method. In 2000 I traveled to England to further my agricultural degree. 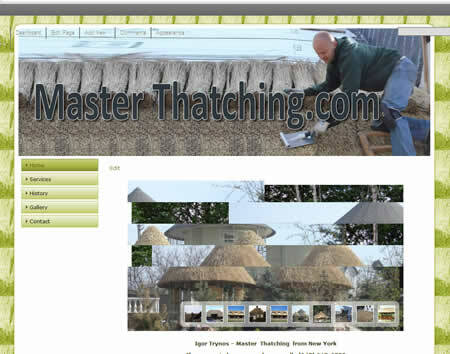 I was happy to be given the opportunity by Mr David Kenward ( ukthatching.com ) to learn the craft . In my 5 1/2 years in England I learned the various methods of thatching – English style. I was awarded a certificate of Excellance in thatching . On my return to The Ukraine I soon became busy carrying out various interesting thatching assignments . In the United States I have been involved with many thatched projects .I have worked in the following States . In England I have worked in Kent , Sussex , Surrey , Essex Cambridgeshire and Southeast London. I was particularly honoured to help thatch shelters at The Royal St. Georges Golf club for the PGA Open Championships at Sandwich in Kent. I have helped in thatching a mammoth project in Holland . So now you know what my capabilities are and you are interested in having such a roof . OR would like to discuss it further do not hesitate to contact me.